Of course, they'll only sell such keys to "Diebold account holders" apparently --- or so they claim --- but that's hardly a problem. C'mon America! Do you still trust your vote to these Diebold morons? Swear to G-d, that's my mailbox key! 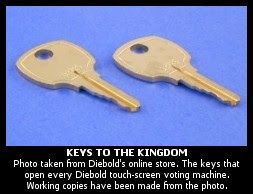 You too can have your very own key to the elections!